The Gilas Pilipinas national team is now in France for the 2014 Antibes International Basketball Tournament held in Antibes, France. 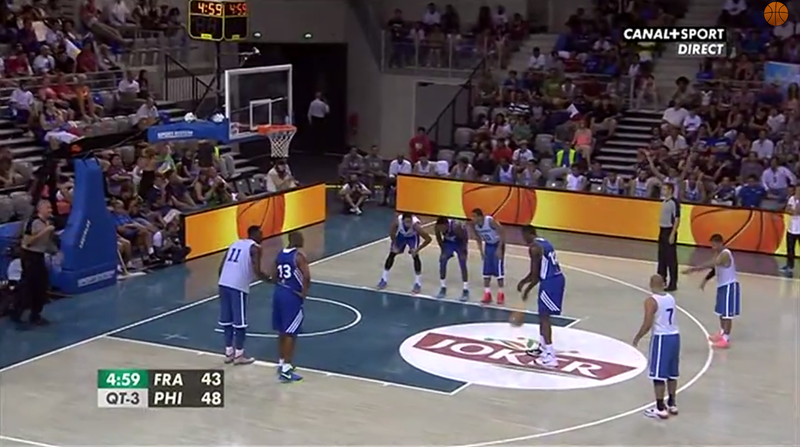 As you all know, in their opening game, Gilas went up against the FIBA Euro champions, Team France. NBA champions namely, Tony Parker, Boris Diaw and Nando de Colo, together with Nicolas Batum, Joakim Noah, Ian Mahinmi, Ronnie Turiaf, Rudy Gobert, Mikel Gelable and other notable NBA veterans are all in France’s roster. However, in this tournament, Parker, Noah and Turiaf are seating out to prepare their bodies for the World Cup grind. Still, Batum, Diaw, Mahinmi, de Colo, Gobert, Gelable are all NBA veterans that could dominate Gilas in their game. Gilas, with the starting five of LA Tenorio, Jeff Chan, Gabe Norwood, Japeth Aguilar and Andray Blatche went out and started strong for the Philippines but that didn’t stopped the French to lead by 2 after the first quarter. The first period was highlighted by this Japeth Aguilar posterization of Ian Mahinmi of the Indiana Pacers. That was really a tone setter for Japeth as he blocked Mahinmi twice later on in the game. Japeth Aguilar’s outstanding energy and athleticism for Gilas is pretty much a crucial part of the team’s game. In international play, you have to be quick on your feet and could have a second or third jump on your legs for those loose balls. Japeth’s energy plays, length and athleticism will be a crucial part for the team and it will certainly make Blatche’s transition to our offense and defense much easier. On the other hand, on some of the parts of this game, you can see Blatche take it to himself and just do too much. Don’t get me wrong, Blatche is a very skilled big man and has the touch to shoot from the three as he showed in their previous tune-up games. But our system is dribble drive and it won’t be effective if he’ll take his defenders off the dribble and drive it himself wherein he could dish the ball out to an open Jeff Chan or Jimmy Alapag on the wings and corners. I can still see him adjust to the system as the team plays more games together. You can also see Blatche’s skills in full displays in some spans in this game wherein he just took advantage of his ball handling skills and length over Boris Diaw and Ian Mahinmi. He’s an upgrade from Marcus Douthit – skills wise, but how about “puso”-wise (heart-wise)? I could see Blatche play his heart out as the team bonds closer to each other. I really admired how Marcus played hard for his new flag and I think we’re seeing him inspiring Blatche to do the same. In the 2nd quarter, Gilas’ three point prowess went on full display as Jeff Chan and Jimmy Alapag hit three after three. Gilas went to lead 39-35 after three quarters. In the dribble drive system, the most important thing is we need to be quick and strong as we drive to the basket and also our shooters need to be sharp and accurate. We need both speed and shooting to work together for this system to be in it’s most effective state. Fortunately, we have, in my opinion, one of the best shooters in the world in Jeff Chan and Jimmy Alapag. The 3rd period is the best period for Gilas in this game as they ended the 3rd leading 55-52 with a Ranidel de Ocampo buzzer beating three pointer. The shooting of the Filipinos killed the French in this quarter. I think the French were caught off guard and didn’t realized how quick and skillful Filipino players are. It’s not as if they weren’t playing hard because they did. You can even tell how their coach was yelling during the timeouts and how Boris Diaw keeps on reminding his team to watch out for Blatche. Gilas lead throughout the first 6 minutes of the 4th before eventually giving up the lead to Nic Batum and the French squad. 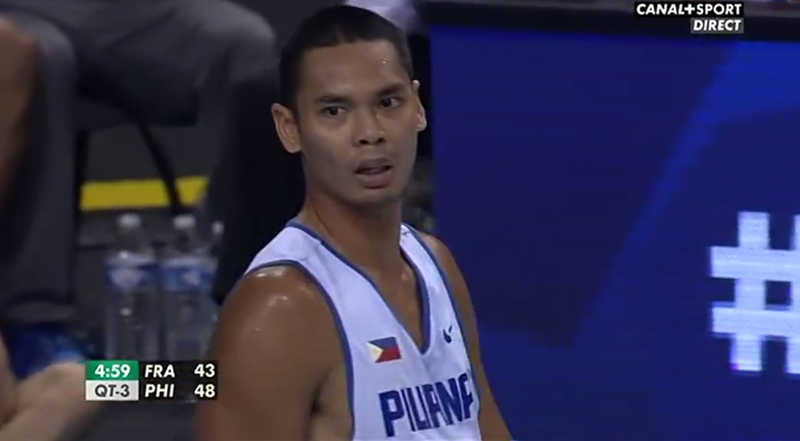 The Filipinos lost to the FIBA Euro champions by just 7 points with the score 75-68. Boris Diaw was just limited to a single point and Batum led the way with 16. Blatche and Lee led the way for Gilas with 12 points a piece. Lee’s superb showing dating back in the last FIBA Asia Cup is making him a shoo-in for a spot in the roster for the World Cup. However, Jason Castro did not suit up for the game and was said to be resting an injury. I believe, with this performance against France to back me up, that the Filipinos will surprise a couple of teams in Group B. I really do think we can get to the second round. We can even give Argentina a tough time with the absence of Manu Ginobili and an aging Luis Scola. I can’t wait to watch more of Gilas Pilipinas. Their next games are against Australia and Ukraine. I’m watching the live Gilas vs Australia game right now and all I can say is that we can really surprise a lot of teams and Jason Castro is playing.